Anti-abortion activist Donna Hebert (left) chats with Cha Cha Canady on Congress Street in June at the edge of the buffer zone created around the entrance across the street to Planned Parenthood of New England. 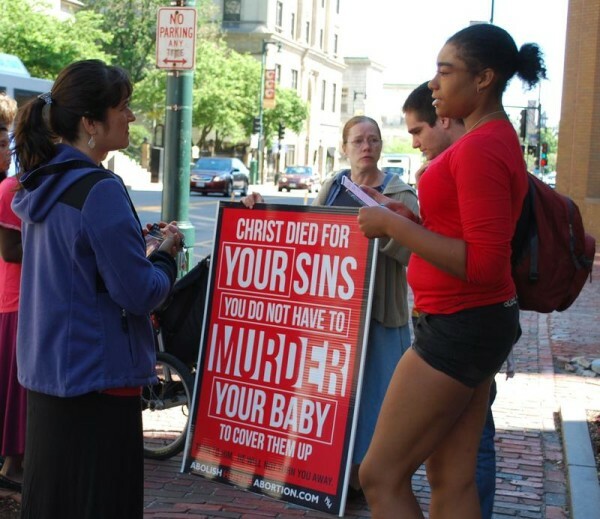 PORTLAND, Maine — A federal judge on Monday declared most aspects of a lawsuit against the city of Portland moot, pointing out that the abortion clinic buffer zone being challenged in the lawsuit was repealed by the city months ago. But U.S. District Court Judge Nancy Torresen stopped short of dismissing the lawsuit in its entirety, leaving alive a motion by the plaintiffs, a group of anti-abortion protesters, to seek nominal damages from the city for the period of time in which they weren’t allowed to demonstrate near the clinic on Congress Street. Erin Kuenzig, an attorney with the Michigan-based Thomas More Law Center representing the demonstrators, said her clients have asked the court to award $1 in damages as a symbolic token of their legal success. “We consider the judge’s ruling a victory,” Kuenzig said Monday evening. “The court found that certain claims were moot based on the city’s repeal of the ‘buffer zone’ ordinance, but that our claims regarding nominal damages should go forward. City spokeswoman Jessica Grondin said the city has no comment on the ruling at this time. Anti-abortion protesters Daniel and Marguerite Fitzgerald, along with two of their seven children and Richmond resident Leslie Sneddon, sued the city in February after city councilors approved a 39-foot no-protest zone around Portland’s Planned Parenthood clinic three months earlier. City officials and Planned Parenthood representatives said the buffer zone protected the civil rights of patients to access health care services, and they accused the anti-abortion demonstrators of being intimidating and belligerent to individuals approaching the facility. The protesters argued the buffer zone infringed upon their constitutionally protected right to free speech. The demonstrators said allegations of aggressive behavior were overblown, as evidenced by the fact that police never issued them any summonses for impeding public ways or disorderly conduct. In June, the U.S. Supreme Court unanimously struck down a similar Massachusetts law establishing 35-foot buffer zones around abortion clinics, overturning what had been a lower court precedent supporting no-protest zones like the one Portland had implemented. With the new Supreme Court precedent declaring such buffer zones unconstitutional, the Portland City Council in early July voluntarily repealed its 39-foot abortion clinic bubble and asked Torresen to dismiss the lawsuit as moot. On Monday, the judge mostly did, granting city motions to dismiss claims against Mayor Michael Brennan and the eight other individual city councilors, as well as requests for injunctive and declaratory relief against the city itself. But Torresen denied the city’s motion to dismiss the plaintiffs’ request for nominal damages against the city of Portland. She ordered both parties to schedule a conference with the court to discuss next steps in the case.